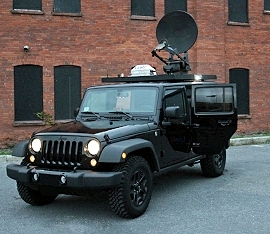 LiveU hybrid IP SNG satellite truck. Singapore, May 2017: LiveU will be presenting its fully-integrated satellite and cellular solution at Broadcast Asia. The all-IP hybrid solution seamlessly adds Ka or Ku satellite bands to LiveU’s bonded cellular units and optimizes the use of the different connections based on network conditions and cost. The solution includes portable and rack-mount LiveU encoders, satellite modems and the LiveU roof-mounted Xtender with multiple cellular connections. Combining satellite and cellular connectivity enables existing SNGs to stream full HD video with high reliability, cost-effectively and without adding satellite spectrums. Supporting least cost bonding mechanisms, LiveU’s hybrid solution automatically adapts how much bandwidth is transmitted over cellular or satellite connections based on customer preferences. It can use cellular at high priority and automatically add bandwidth from the satellite segment as needed, or utilize the available satellite spectrum and add cellular to increase bandwidth. SZMG (Shenzhen Media Group), one of the top ten TV stations in China, is using LiveU’s LU700 encoder and Xtender together with satellite transmission in the first 4G and satellite hybrid SNG solution of its kind in China. LiveU is presenting its full range of live IP video uplink services and streaming solutions at Broadcast Asia 2017, SUNTEC Singapore, 23-25 May 2017, booth 6N4-01.